You are here: Home / food / Have You Heard About This Sneaky Trick People are Using To Get FREE Tacos During the World Series?? Have You Heard About This Sneaky Trick People are Using To Get FREE Tacos During the World Series?? Do you like Taco Bell FREE food? I sure do. If you do too, you have to keep an eye out for two possible Doritos Locos taco freebie offers that may be available very soon! 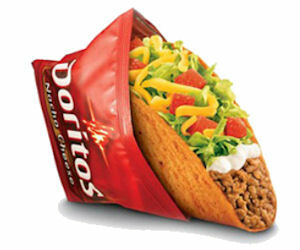 If a player steals a base during the first or second game of the World Series 2016, everyone who visits a Taco Bell restaurant will get a FREE Doritos Locos taco just because on Wednesday, November 2! If a player steals a base during games three through seven of the Indians World Series, you can claim your FREE taco on Thursday, November 10. The best part about this awesome offer is that no purchase is necessary in order to get your FREE tacos at Taco Bell! The baseball players just have to do their thing and steal those bases! Monitor the games so you will know if these freebie deals actually will be offered. Should these freebie offers be available, you can claim them by going through the drive through or ordering them in the restaurant. The FREE tacos will only be available the specific days noted in this post and only if players steal bases. If for some reason the bases are not stolen, get mad at the players not at Taco Bell!